Naval surgeon Maurice Felton (1803-42) gained considerable acclaim from his secondary pursuit, painting landscapes and society portraits. Unfortunately his Australian career was short lived, due to his untimely death from unrecorded causes less than four years after his arrival in Sydney. This portrait is one of the artist’s finest. 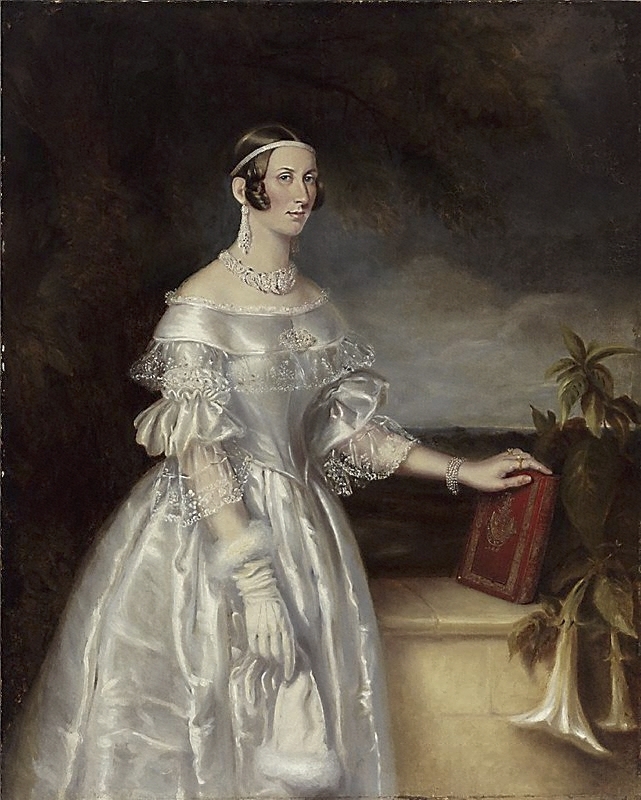 Its subject, Frances Maria Spark, was the wife of successful merchant and art patron Alexander Brodie Spark, who commissioned this portrait shortly after their marriage. Mrs Spark was a woman of substance in colonial society, residing with her husband at Tempe House, the John Verge (1782-1861) designed house on the Cooks River, south of Sydney. This original frame was commissioned by Mr Sparks from Solomon Lewis in 1840, and was restored in 2008. The gilded surface is mostly original. Signed l.r. on upper spine of book, yellow oil "M FELTON". Dated l.r. on lower spine of book, yellow oil "1840".